Since its release back in 2005, fans around the world have been eagerly pining for the long-awaited numbered sequel to Kingdom Hearts II. Multiple titles have been released since then on a variety of platforms, with the last being Kingdom Hearts: Dream Drop Distance on the Nintendo 3DS back in 2012 . In the seven-year period we’ve had to wait for another fully-fledged Kingdom Hearts title, the series has been re-released, and even re-re-released on the PlayStation 3 and PlayStation 4 in different collections, and even today Kingdom Hearts Union χ remains an active game for mobile. Now here we are at least, with the release of Kingdom Hearts III on the PlayStation 4 and Xbox One. 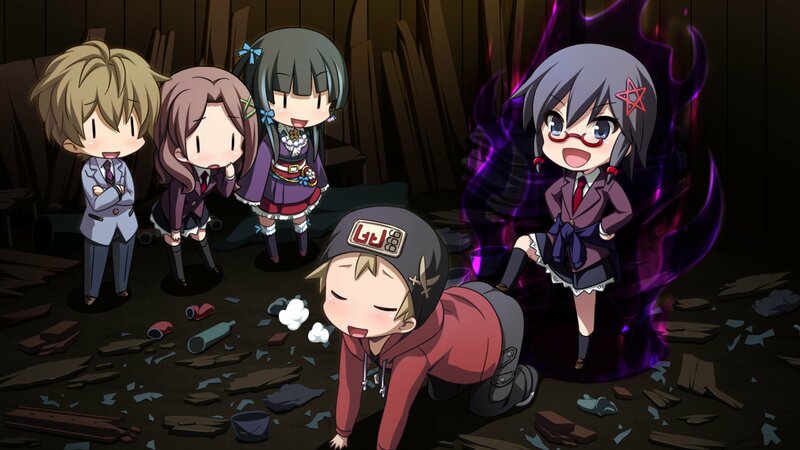 Does the latest title in the series make the story and its build-up worth the wait? Note: This review does not discuss story spoilers. As mentioned above, we won’t be revealing any story spoilers for this review. 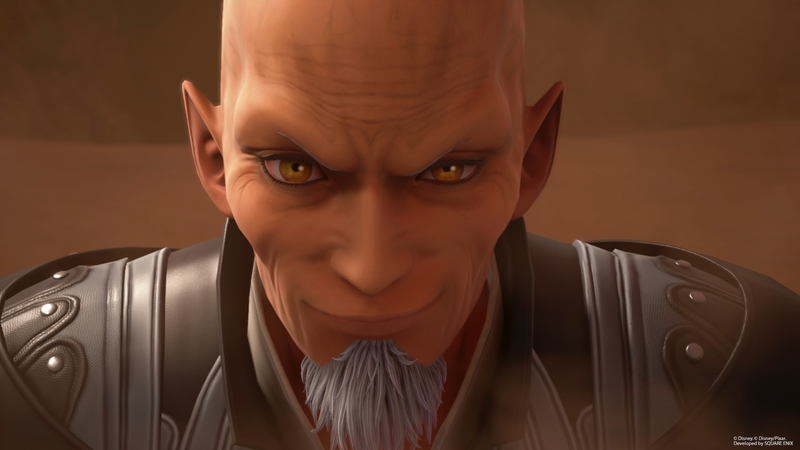 The story of Kingdom Hearts III is the final chapter of whats been called the Dark Seeker Saga- a story that started with the first entry in the series and has been continuing ever since. We certainly wouldn’t want to ruin the experience for anyone. However, there are some things that we can (and should) talk about regarding the story-telling of this latest entry. Specifically, that of the worlds that you visit. It’s no secret that the series has been plagued with a long, strange, and confusing story. This latest entry in the series doesn’t make things any better. Though, it doesn’t make it any worse either. Funny enough, the largest story-based issues that I found myself dealing with were the stories of the various worlds that Sora, Donald and Goofy explore during their adventure. The game feels like it relies (perhaps too heavily) on the player having seen the corresponding movies of each of the worlds. In the Kingdom of Corona world, based on the movie Tangled (which I have not seen), the story of Rapunzel and her friends felt full of holes. Likewise, when I visited The Caribbean and found myself reunited with Captain Jack Sparrow, I found the story was oddly paced and felt like it wasn’t delivering the whole story to me. Too much happens to the characters of these worlds off-screen and it unfortunately creates narratives that often feel disjointed. The series has come a long way since the combat and gameplay systems of the original. Kingdom Hearts III takes elements from games across the series and combines them into what is the most fun battle system yet. Keyblades, Sora’s weapon of choice, are back. As is usually the case, after the completion of each world, you’ll be awarded a new weapon based on that world. Kingdom Hearts III however, takes Keyblades to an entirely new level by allowing them to transform during combat. Situation commands will appear over the main menu often during your battles. Building a gauge with your Keyblade or magic casts will allow you, after charging it up, to activate a Keyblade’s secondary form, or to cast even more powerful magic. As an example, the Keyblade you get for completing your run through Monsters, Inc.’s Monstropolis, Happy Gear, can transform into Agile Claws. After building your gauge up, transforming, and building it again, you can then transform it into Twin Yo-Yos. Sora’s Shooting Star Keyblade can turn into a pair of Arrowguns before turning into a Launcher, allowing you to shoot at enemies from a distance, changing up the battle options even more. After powering up a Keyblade to its last transformation, you’re able to use another situation command to deliver a stylish final attack, reverting the weapon to its original state to start the build-up and transforming process again. 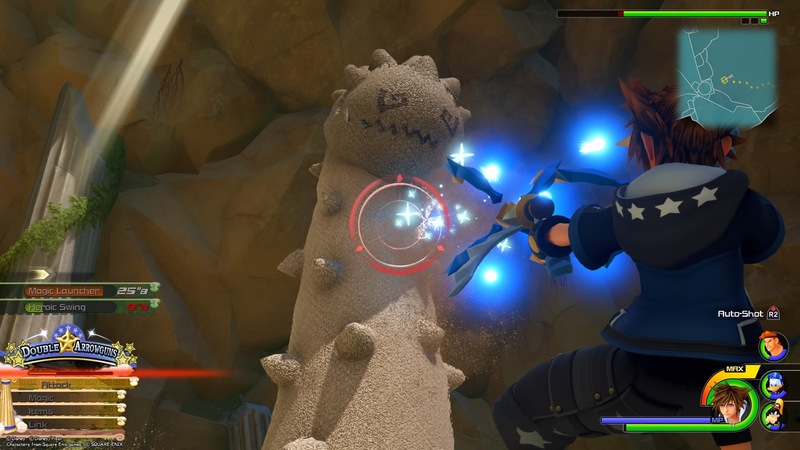 KHIII also allows Sora to equip up to three keyblades at once, being able to switch between them freely in combat. Other situation commands can appear during combat as well. Both Donald and Goofy have commands that can activate, allowing Sora to team up with them to do a special attack. 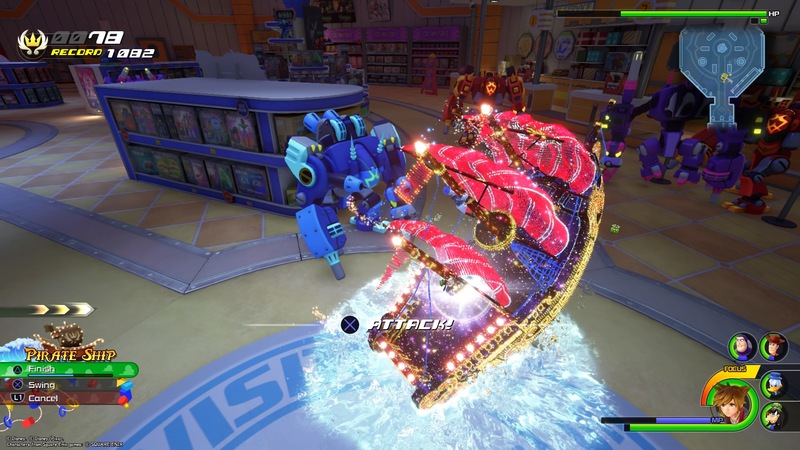 The most flashy of these situation commands, however, are the “attractions.” During combat, players might have the ability to summon what are essentially theme park rides, and use them to deal damage to enemies. 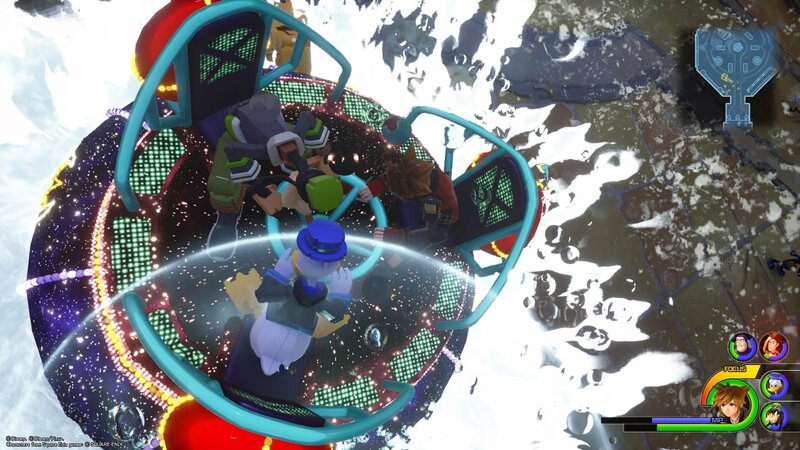 A Pirate Ship, Tea Cups, and Splash Run are only a few of the large, flashy attacks that can be called up. The only issue I have with the combat is that sometimes I find myself with too many situation commands active, having to scroll through the list and select the one I want to use. It should be noted that you can have multiple commands queued and ready to go. Assuming that the timers for them don’t run out, you can use them one right after the other, creating a fun sequence of attacks. Kingdom Hearts: Birth By Sleep’s Shotlock system, and Kingdom Hearts: Dream Drop Distance’s flowmotion are also included in the mix as well as the Link system, which lets you summon the aid of friends like Wreck-it-Ralph or Ariel, giving you even more tools to use during combat. Another staple of the series, the Gummi Ship, also makes a return in a way we haven’t seen before. 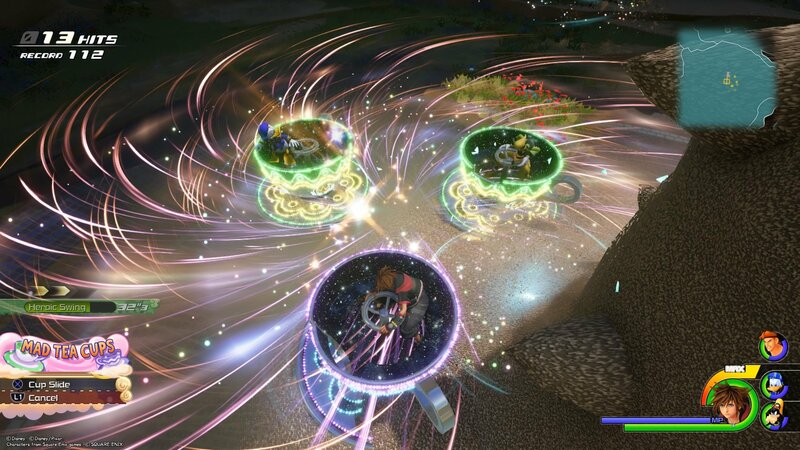 While the ship editor feels largely unchanged from previous games, Kingdom Hearts III takes the on-rails shooting experience of traversing between worlds and removes the rails, allowing you to fly in a large open area. As you fly around, you can run into enemies and trigger encounters which moves you into a more classic Gummi Ship set up, blasting away at enemies, wave after wave until the mission is done. There are several of these open world maps to explore, each one filled with missions and items to collect. Some of these encounters have certain requirements as well that you’ll need to fulfill by spending time customizing your ship and outfitting it with different parts. Lucky Emblems can be found everywhere! Kingdom Hearts III gives the player a lot to explore within the different areas they visit. Whether it be the space between worlds in your Gummi Ship, or the rocky slopes of Mount Olympus, the game hides collectibles everywhere. I found myself spending three to four hours in each world, the majority of that time spent exploring as much of the map as I could while trying to find chests and lucky emblems – a Mickey Mouse shape that can earn you rewards if you take a picture of them. The Caribbean especially offers a solid amount of exploration and is almost like a mini Assassin’s Creed IV, allowing you to captain your own ship and freely roam the waters, exploring a variety of different islands. Another type of item I found myself constantly on the look-out for during my playthrough were ingredients. 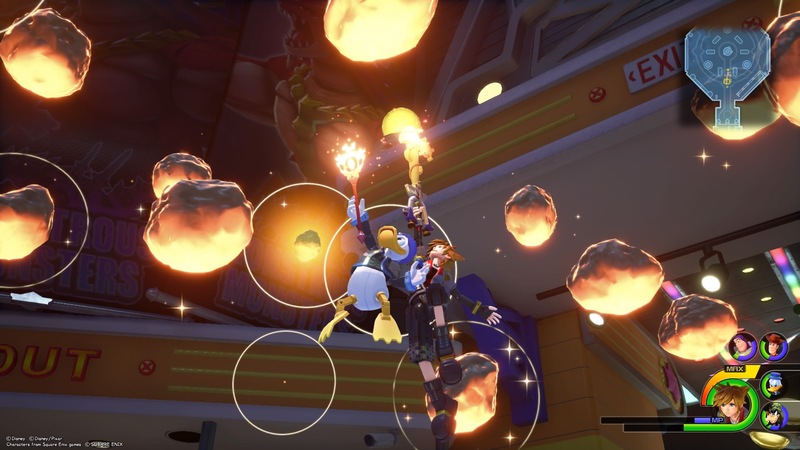 Not to be outdone by Final Fantasy XV‘s cooking, Tetsuya Nomura has included cooking and temporary stat boosts into Kingdom Hearts III by way of minigames with Ratatouille’s Little Chef. Is This A Movie? This Looks Like A Movie! 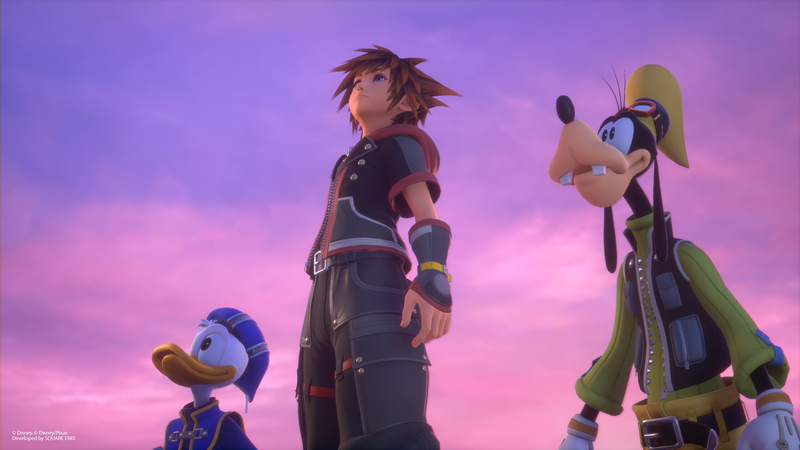 Kingdom Hearts III also makes a big change in the looks department with the use of Unreal Engine. Every game in the series, aside from the mobile title, has used the same PlayStation 2-era art style. 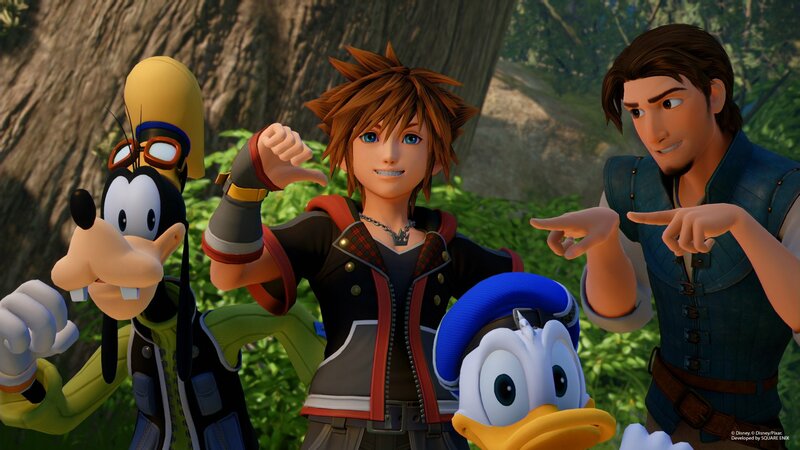 Kingdom Hearts III makes amazing use of the Unreal Engine, rendering Pixar characters and making them look exactly like they do in their films, if not better. 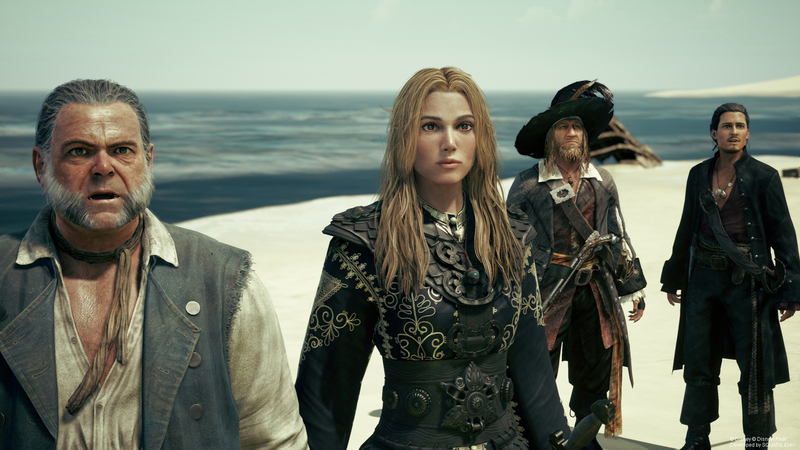 Being the only world based on a live action movie, the character models of The Caribbean can look a bit off. However, they do largely look great, and the pre-rendered cutscenes that occur in this world look like they’re right out of the movies. 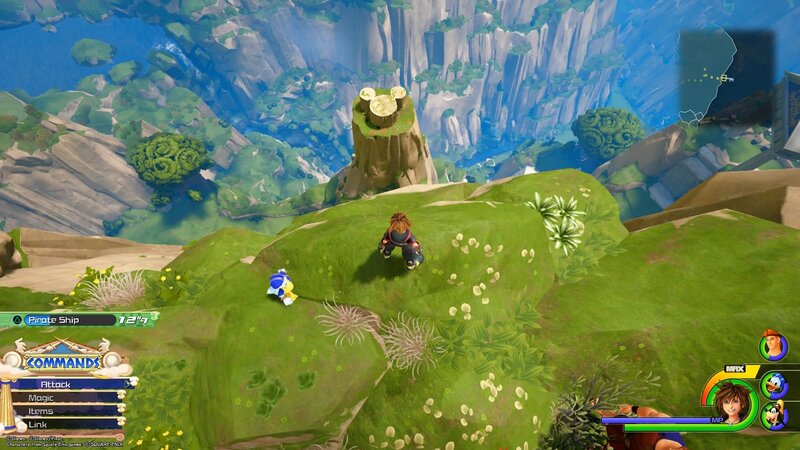 Because of the power of today’s consoles, there can be a lot more things on screen at once than there could be during the PlayStation 2 era, and Square Enix is taking the opportunity to fill the towns of Kingdom Hearts III with actual occupants. 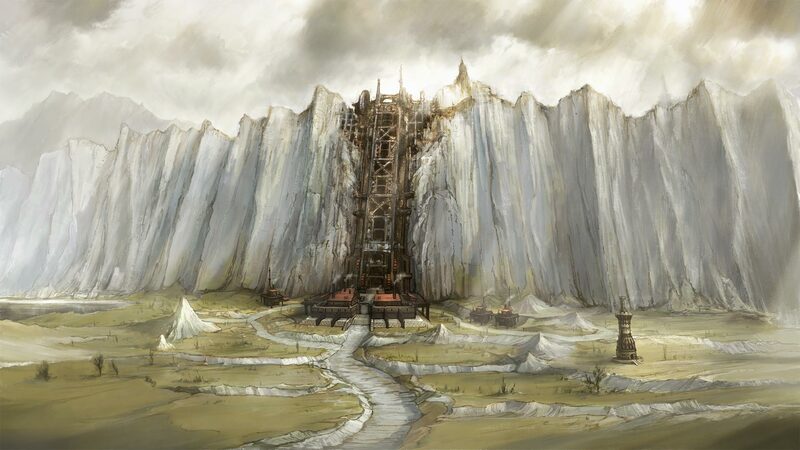 In the days of Kingdom Hearts II, towns were scarcely populated. Now, however, the main town of the game is absolutely bustling with people all over the place. As a long time fan of the series, I was so pleased to see this. The musical pieces in Kingdom Hearts III also deliver a strong performance, ranging from themes for the various worlds, to higher quality arrangements of some pieces we’ve heard from the series in the past. Yoko Shimomura has crafted a wonderful soundtrack, and the new songs from Utada Hikaru are incredible additions to her previous songs of the series. Kingdom Hearts III takes a lot of components from previous games and blends them well together for the newest adventure in the series, wrapping it all in a the gorgeous graphics from the Unreal Engine. That having been said, there are some very questionable exclusions with the absence of things like the Olympus Coliseum and Characters like Leon, Cloud, or really, any Final Fantasy character for that matter. When I think Kingdom Hearts, those are some of the things that immediately come to mind, and it feels strange not having them here in the latest numbered entry of the series. The story has its flaws, but with a confusing narrative that has spanned so many games over so many years, it’s hard to say if anyone could really bring all of these pieces together in a way that makes sense and feels right. I completed the game in around 30 hours, and have spent another 7 or so flying around in my Gummi Ship, seeking out additional Lucky Emblems, and exploring what appears to be a fairly hollow post game experience. I still have ultimate weapons to craft, Gummi Ship missions to conquer and hidden Mickeys to collect, and I can easily see myself continuing to play the game to complete the side content that is there. Its been a long wait for Kingdom Hearts III, and now that it’s finally here, I can say that it’s a solid entry for the series, and definitely one that fans should check out. 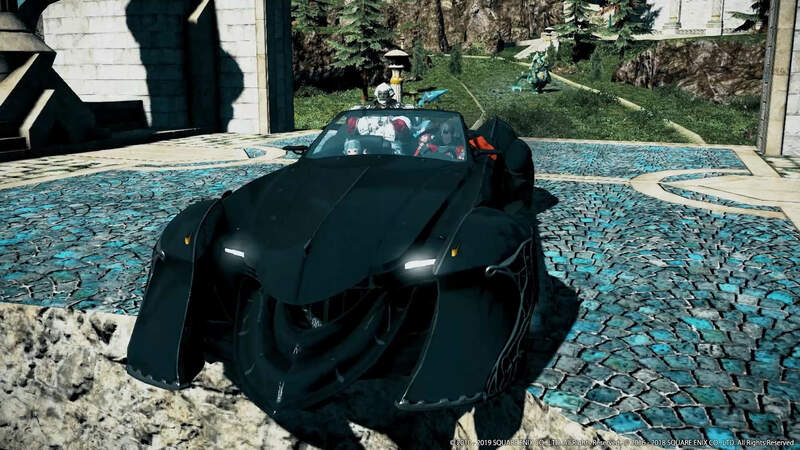 Review copy provided by Square Enix for PlayStation 4. Screenshots provided by Publisher and taken by reviewer.